There are a lot of new features in Connected Franchise this year, if you’ve noticed. Madden 17 brings a more in-depth franchise experience to the table this year. It forces you to think more like an actual NFL coach or general manager in order to preserve your franchise on a long-term basis. 1. 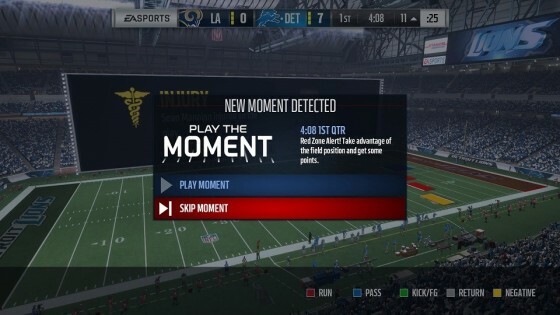 Don’t overdo Play the Moments: I was skeptical at first when hearing about this Play the Moments feature, but after playing a full franchise with the Houston Texans with only PTM, it was impressive and fun. But if you want to get the full franchise experience, don’t make playing PTM an everyday occurrence. It’s a fun mode to play with friends or to kill some time, but not if you want to play a full-fledged franchise mode with all the trimmings. 2. Do everything on your to-do list: With CFM deeper than ever, there are more tasks to accomplish each week. Make sure to do everything that’s on your agenda that week. Scouting, re-signing (or not re-signing) players and training. It’s no longer acceptable to skip a step or two as you progress through the season. In order to succeed in building an acceptable franchise to your liking, you’re going to have to put in some work this year. 3. Pick whichever role you want: There are no limits to being an owner or coach this year. Owners have all the power of a coach (yes, even formation subs) with the ability to relocate and renovate a stadium. A coach has all the power of a coach, but avoids the craziness of funds and jersey sales. Whichever your prefer, choose a role and have a ball. Being an owner might be more fun, especially if you think you can do a better job than Jerry Jones. 4. Utilize your practice squad: This is important for the future of your franchise. Keep an eye on the guys you send to the practice squad, see how they develop and figure out whether or not they’ll be useful going forward. There might be a hidden gem or two that can take a roster spot and force you to make the tough decisions. 5. Enjoy the game: This is probably the best Madden to date — even though this is something that’s said year after year. This one feels more fluent and has the right balance between realism and video game. Almost everything is improved, and with the right slider set, it’s hard to not find some fun.